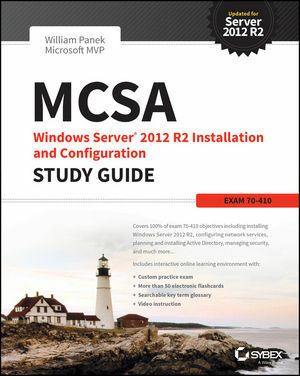 MCSA: Windows Server 2012 R2 Installation and Configuration Study Guide: Exam 70-410 provides complete preparation for exam 70-410: Installing and Configuring Windows Server 2012 R2. With comprehensive coverage of all exam topics and plenty of hands-on practice, this self-paced guide is the ideal resource for those preparing for the MCSA on Windows Server 2012 R2. Real-world scenarios demonstrate how the lessons are applied in everyday settings. Readers also get access to the interactive practice tests, electronic flashcards, and video demonstration of the more difficult tasks, which help readers fully understand the scope of principles at work. Exam prep is about more than passing the test—it helps you gain hands-on experience performing more complex operations, giving you the confidence you need to successfully apply what you've learned in a work environment. If you're looking to triumph over the MCSA exam 70-410, MCSA: Windows Server 2012 R2 Installation and Configuration Study Guide: Exam 70-410 provides the information and practice you need.